In the words of John F Kennedy, nothing compares to the simple pleasure of a bike ride. The rich and varied history of the bicycle is celebrated in this four day festival that examines the social and environmental benefits that have been derived from this remarkable machine. Cyclescreen, Bristol’s first dedicated bike film festival, returns this August with an exciting programme of documentaries and talks from some of the leading filmmakers and authors from cycling culture. Throughout the festival we’ll be celebrating the ways this wonderfully adaptable machine contributes to people’s lives and continues to establish itself in the hearts of the Great British public. We’ll explore its evolution over the last century here in the UK and look at how Bristol and the South West has played its part in the story with the founding of the national cycle network. We’ll look back at the lives of two of the most inspiring women ever to take to two wheels and celebrate their remarkable achievements both on and off the bike. We’ll relive some of the great dramas that the bike has provided us with through its rich history as a sport and explore how today’s filmmakers and authors are taking us closer into the sports history than ever before. And we’ll be un-earthing the stories of how the bike has been used as a tool for adventure and creativity in the lives of normal everyday people. The bike means many things many different people. Whether you’re a seasoned two-wheeler, a fan of the sport, a recreational cyclist or discovering the bike for the very first time, come and indulge in the rich and inspiring story of the bicycle. Cyclescreen is supported by Bristol Green Capital 2015 and Better by Bike. The story of a young Deaf man called James Duthie who in 1951 biked from his Scottish fishing village to the Arctic Circle and back again. Director Matt Hulse worked for 12 years on this visual mix of documentary and fiction and the result is a treat for both the eyes and ears. Cycling author and journalist Herbie Sykes talks about his award winning book about the life of East German cyclist Dieter Wiedemann who in 1964 rode the Peace Race under socialism and Stasi surveillance before dramatically defecting to the West. Nick Hand and Robin Mather discuss their recent collaboration involving building a custom made bicycle which they rode to Mainz in Germany – the spiritual home of the printing press. A selection of films examining the niche art of time-trialing including Danish auteur Jorgen Leth’s iconic 1974 documentary of his compatriot Ole Ritter’s attempt on the iconic World Hour Record and Daniel Dencik's honest and heartbreaking study of Danish time-trial specialist Rasmus Quaade. Auther and cycling journalist Edward Pickering examines the rich history of cyclng’s most iconic record including a very British rivalry that would redefine the sport and set in motion a new era of British cycling, the legacy of which we enjoy to this day. Engrossing documentary looking back at the pivotal 1986 Tour de France and the epic rivalry between cyclists Greg LeMond and Bernard 'The Badger' Hinault. 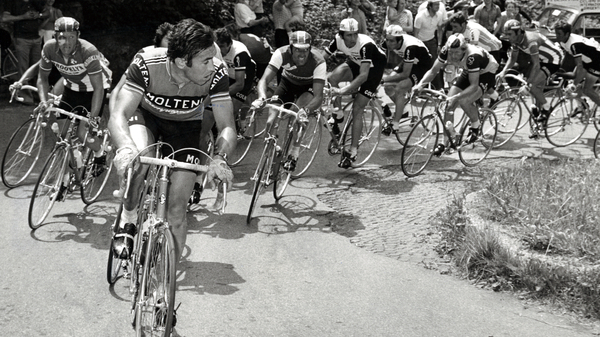 An all time classic of the cycling genre, this glorious study of Eddy Merckx, a rider who dominated an entire cycling generation, is an inspirational study in determination and a cinematic poem to the greatest rider of all time. Scottish director Finlay Pretsell joins author and cycling journalist Daniel Friebe to discuss his exciting collaboration with enigmatic racing cyclist David Millar. A double bill of films looking back at two of the most inspiring women to ever make use of bicycle. One became one the world’s foremost travel writers – the brilliant and fearless Dervla Murphy and the other was the time trial sensation that was the magnificent Eileen Sheridan. The story of cycling in the land that invented the modern bicycle, its birth, decline and rebirth from Victorian origins to today including Bristol’s pioneering role in the birth of Sustrans and the National Cycle Network.